Nikki-Gil's family home has Scandi-inspired details and modern furniture pieces. 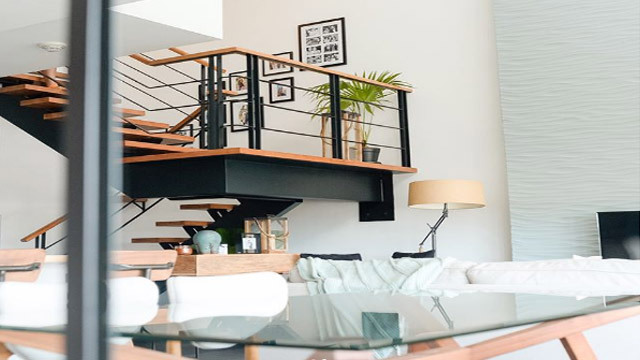 Around two years ago, we featured Nikki Gil’s family home in Las Pinas—a striking three-story property with a modern façade and tropical-inspired interiors. Nikki’s Mommy Julie, who studied at the Philippine School of Interior Design, was in charge of finalizing the home’s look and she opted to work on a contemporary-meets-Balinese style. We love the home’s resort-like lanai and how the third floor served as Nikki’s personal space complete with a roomy bedroom, her own T&B, and a walk-in closet. Fast forward to today—the former VJ is happily married and a proud mom to Baby Finn. After exchanging I dos, Nikki and her husband BJ Albert moved into a spacious bi-level apartment with huge windows and a view of the city. We browsed through Nikki’s Instagram feed to see how they were able to spruce up their home. A wood and metal staircase instantly grabs the attention of guests the moment they step inside the space. The finish of the steps and handrail adds to the Scandinavian appeal of the home and complements the furniture pieces. Given the potted plant that livens up the space under the stairs and the green wonders on the console table, it’s safe to say that the homeowners are fans of indoor plants like many of us. In the same post she shared recently, Nikki thanked Mommy Julie for some last-minute styling and ID-ing (interior designing). We’re sure they had fun decorating the apartment and making sure it’s comfy and functional. Since Nikki and BJ belong to a huge barkada, it’s a given to host get-togethers every now and then. The open layout of the living, dining, and kitchen areas makes it easier to entertain and welcome guests, while the neutral-colored accessories and furnishings go well with the natural wood finish seen on the dining chairs and table. We also noticed a light-colored wallpaper defining the wall in the living area. Whites and grays dominate the inviting living area. A slim center table holds décor pieces and a couple of books, while a floor pouf serves as an extra seating piece. To personalize the wall near the staircase, Nikki decided to have a gallery wall showcasing photographs encased in black frames in different sizes. Working with frames in different sizes and colors keeps the setup from being boring. Of course, cutie little Finn gets his own room, too! Defined by subdued colors, stripes, and furniture in white, the nursery is a snug space that also features his grandma’s watercolor paintings and more charming accessories. To keep clutter at bay, wooden containers can be seen in the room. A wooden organizer filled with plushies and personalized with Finn’s name can be seen on top of a dresser. The piece is by Littlest Setter, a shop that sells baby accessories, clothes, and décor. Nikki and BJ’s room is simple yet modern, with an upholstered headboard and a wallpaper as its focal point. We can’t miss the kitchen, too! It has beveled subway tiles as backsplash, overhead cabinets with niches for small appliances, and an island that doubles as a breakfast nook. Don’t you just love the wood countertop? It gives the cooking area a homey, country vibe. What do you love best about Nikki and BJ’s home? Let us know on Facebook! *Minor edits have been made by the PEP.ph editors.